1.LE note 2, p. 101: The text of this aphorism, in black-letter in the 1880 edition, is the whole of § 2. For the sense of "dominion" in the summary of the aphorism, see above, p. 28 n., and below, p. 138 n.
31. JR note, p. 119: “Literature of the Fine Arts.” — Essay on Bas-relief. "The architectural decoration of any space depends of course broadly on the introduction of shade into it, if it be light, and of light if it be shadowed. Given a space of wall to be ornamented within and without the respective necessities are both met by simple penetrations or holes, which, seen from within, are forms of light, and from without are forms of shade. 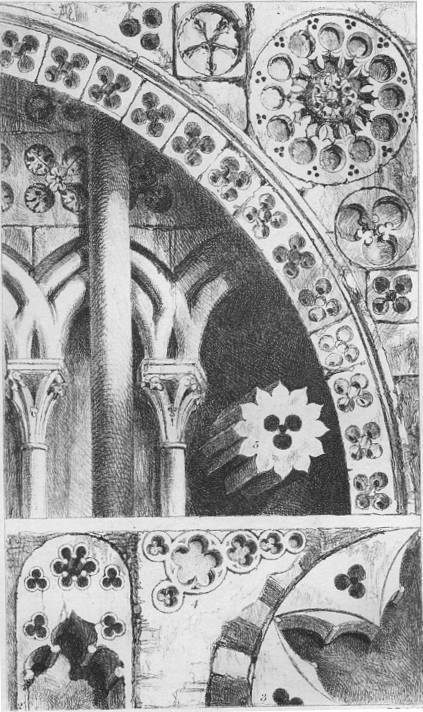 These forms of shade necessary in the actual window, were taken up by the early Gothic architects as features of wall decoration: and many surfaces which it was prepared to render interesting were covered with arrangements of starry or circular forms, cut so deep into the stone as in most lights to seem a broad, if not total interior shade. Where it was possible, as in raised screens of stone, these forms were generally cut through, so as to tell as masses of vigorous dark on the light surfaces, but whether so cut or not, the design and arrangement was based on the form of the spaces so cut out, usually trefoils or quatrefoils, variously grouped and considered, and in more elaborate instances becoming wheel or star windows, the idea being always of dark and beautiful forms placed on a white ground, like clover leaves or woodroof leaves laid on paper, no attention whatever being paid to the shapes of the intermediate light surfaces. 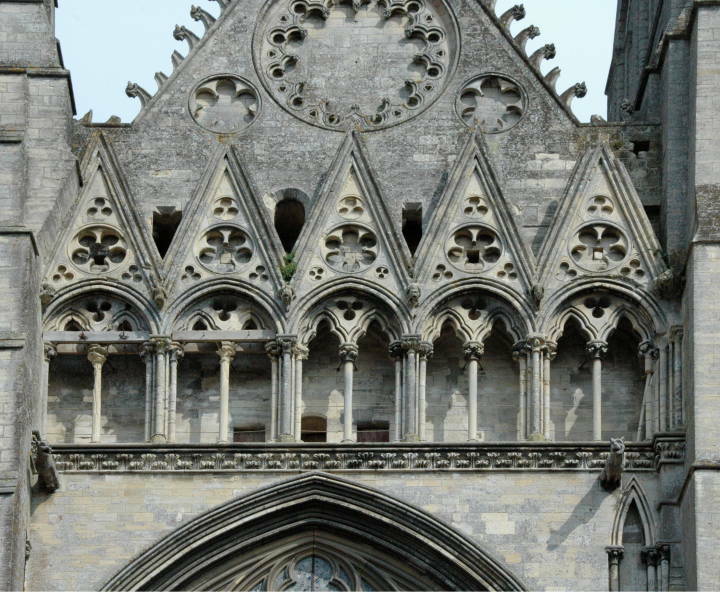 The two pediments of the west front of Bayeux (Pl. —) and the door of Lisieux (Pl. —) will give a perfect idea of the system, and the proneness for shade in the latter by making the quatrefoils concave is very remarkable." 55*. 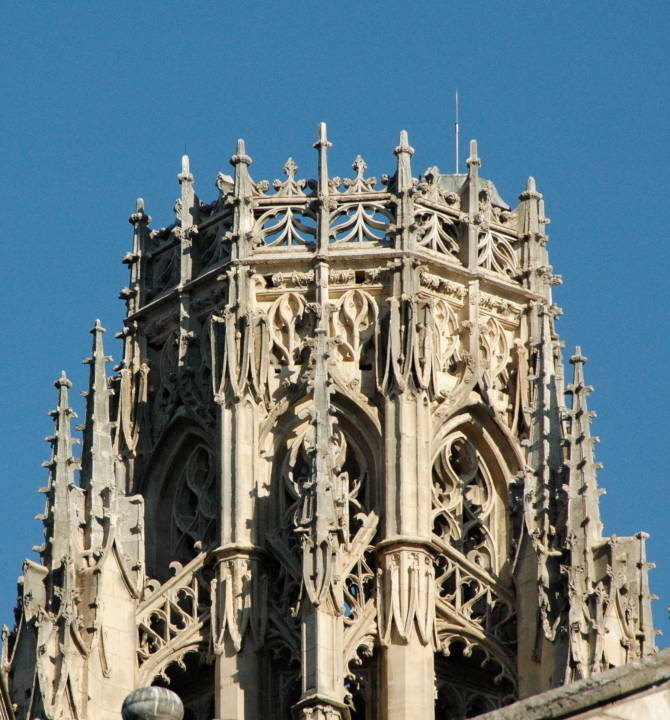 JR note, p. 129: The reader cannot but observe the agreeableness, as a mere arrangement of shade, which especially belongs to the “sacred trefoil.” I do not think that the element of foliation has been enough insisted upon in its intimate relations with the power of Gothic work. If I were asked what was the most distinctive feature of its perfect style, I should say the trefoil. It is the very soul of it; and I think the loveliest Gothic is always formed upon simple and bold tracings of it, taking place between the blank lancet arch on the one hand, and the overcharged cinquefoiled arch on the other. 58. 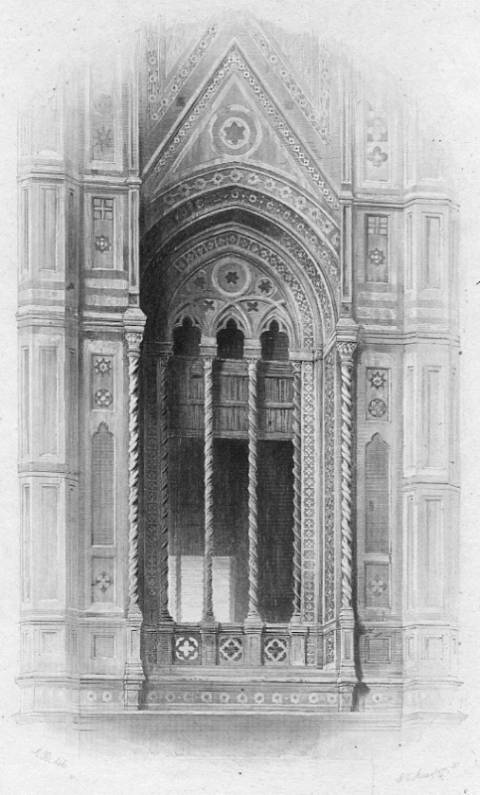 JR note, p. 131: The plate represents one of the lateral windows of the third storey of the Palazzo Foscari. 1 It was drawn from the opposite side of the Grand Canal, and the lines of its traceries are therefore given as they appear in somewhat distant effect. It shows only segments of the characteristic quatrefoils of the central windows. I found by measurement their construction exceedingly simple. Four circles are drawn in contact within the large circle. Two tangential lines are then drawn to each opposite pair, enclosing the four circles in a hollow cross. An inner circle struck through the intersections of the circles by the tangents, truncates the cusps. § 1. In recalling the impressions we have received from the works of man, after a lapse of time long enough to involve in obscurity all but the most vivid, it often happens that we find a strange pre-eminence and durability in many upon whose strength we had little calculated, and that points of character which had escaped the detection of the judgment, become developed under the waste of memory; as veins of harder rock, whose places could not at first have been discovered by the eye, are left salient under the action of frosts and streams. The traveller who desires to correct the errors of his judgment, necessitated by inequalities of temper, infelicities of circumstance, and accidents of association, has no other resource than to wait for the calm verdict of interposing years; and to watch for the new arrangements of eminence and shape in the images which remain latest in his memory; as in the ebbing of a mountain lake, he would watch the varying outline of its successive shore, and trace, in the form of its departing waters, the true direction of the forces which had cleft, or the currents which had excavated, the deepest recesses of its primal bed. In thus reverting to the memories of those works of architecture by which we have been most pleasurably impressed, it will generally happen that they fall into two broad classes: the one characterised by an exceeding preciousness and delicacy, to which we recur with a sense of affectionate admiration; and the other by a severe, and, in many cases, mysterious, majesty, which we remember with an undiminished awe, like that felt at the presence and operation of some great Spiritual Power. From about these two groups, more or less harmonised by intermediate examples, but always [100/101] distinctively marked by features of beauty or of power, there will be swept away, in multitudes, the memories of buildings, perhaps, in their first address to our minds, of no inferior pretension, but owing their impressiveness to characters of less enduring nobility to value of material, accumulation of ornament, or ingenuity of mechanical construction. Especial interest may, indeed, have been awakened by such circumstances, and the memory may have been, consequently, rendered tenacious of particular parts or effects of the structure; but it will recall even these only by an active effort, and then without emotion; while in passive moments and with thrilling influence, the images of purer beauty, and of more spiritual power, will return in a fair and solemn company; and while the pride of many a stately palace, and the wealth of many a jewelled shrine, perish from our thoughts in a dust of gold, there will rise, through their dimness, the white image of some secluded marble chapel, by river or forest side, with the fretted flower-work shrinking under its arches, as if under vaults of late-fallen snow; or the vast weariness of some shadowy wall whose separate stones are like mountain foundations, and yet numberless. § 2. Now, the difference between these two orders of building is not merely that which there is nature between things beautiful and sublime. It is, also, the difference between what is derivative and original in man's work;2 for whatever is in teiiectuai architecture fair or beautiful, is imitated from natural forms; and what is not so derived, but depends for its dignity upon arrangement and government received from human mind, becomes the expression of the power of that mind, and receives a sublimity [101/102] high in proportion to the power expressed. All building, therefore, shows man either as gathering or governing; and the secrets of his success are his knowing what to gather, and how to rule. These are the two great intellectual Lamps of Architecture; the one consisting in a just and humble veneration for the works of God upon the earth, and the other in an understanding of the dominion over those works which has been vested in man. § 3. Besides this expression of living authority and power, there is, however, a sympathy in the forms of noble building, with what is most sublime in natural things; and it is the governing Power directed by this sympathy, whose operation I shall at present endeavour to trace, abandoning all inquiry into the more abstract fields of Invention: for this latter faculty, and the questions of proportion and arrangement connected with its discussion, can only be rightly examined in a general view of all the arts; but its sympathy, in architecture, with the vast controlling powers of Nature herself, is special, and may shortly be considered; and that with the more advantage, that it has, of late, been little felt or regarded by architects. I have seen, in recent efforts, much contest between two schools, one affecting originality, and the other legality many attempts at beauty of design many ingenious adaptations of construction; but I have never seen any aim at the expression of abstract power; never any appearance of a consciousness that, in this primal art of man, there is room for the marking of his relations with the mightiest, as well as the fairest, works of God; and that those works themselves have been permitted, by their Master and his, to receive an added glory from their association with earnest efforts of human thought. In the edifices of Man there should be found reverent worship and following, not only of the spirit which rounds the pillars of the forest, and arches the vault of the avenue which gives veining to the leaf, and polish to the shell, and grace to every pulse that agitates animal organisation, but of that also which reproves the pillars of the earth, and builds up her barren precipices into [102/103] the coldness of the clouds, and lifts her shadowy cones of mountain purple into the pale arch of the sky;3 for these, and other glories more than these, refuse not to connect themselves, in his thoughts, with the work of his own hand; the grey cliff loses not its nobleness when it reminds us of some Cyclopean waste of mural stone; the pinnacles of the rocky promontory arrange themselves, undegraded, into fantastic semblances of fortress towers; and even the awful cone of the far-off mountain has a melancholy mixed with that of its own solitude, which is cast from the images of nameless tumuli on white sea-shores, and of the heaps of reedy clay, into which chambered cities melt in their mortality. § 4. Let us, then, see what is this power and majesty, which Nature herself does not disdain to accept from the works of man; and what that sublimity in the masses built up by his coralline-like energy, which is honourable, even when transferred by association to the dateless hills, which it needed earthquakes to lift, and deluges to mould. And, first, of mere size: It might not be thought possible to emulate the sublimity of natural objects in this respect; nor would it be, if the architect contended with them in pitched battle. It would not be well to build pyramids in the valley of Chamouni; and St. Peter's, among its many other errors, counts for not the least injurious its position on the slope of an inconsiderable hill.4 But imagine it placed on the plain of Marengo, or like the Superga of Turin, or5 like La Salute at Venice! 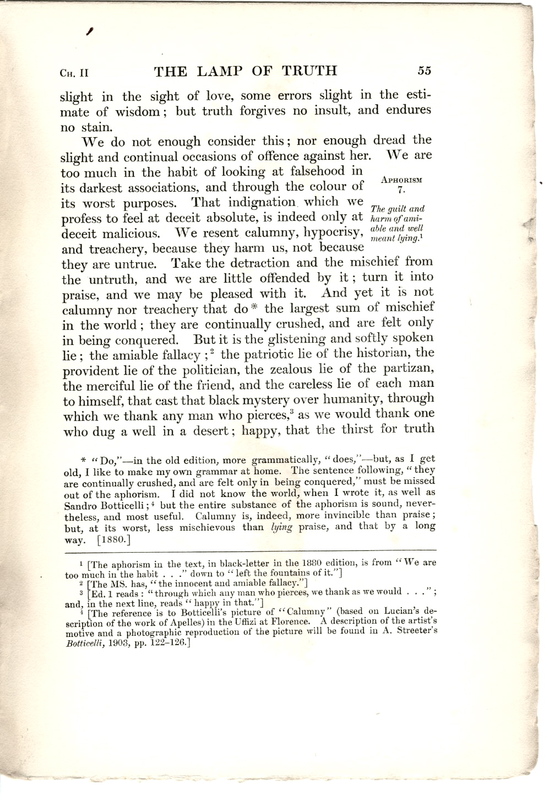 The fact is, that the apprehension of the size of natural objects, as well as of architecture, depends more on fortunate excitement of the imagination than on measurements by the eye; and the architect has a peculiar advantage in being able to press close upon the sight such [103/104] magnitude as he can command. There are few rocks, even among the Alps, that have a clear vertical fall as high as the choir of Beauvais; and if we secure a good precipice of wall, or a sheer and unbroken flank of tower, and place them where there are no enormous natural features to oppose them, we shall feel in them no want of sublimity of size. And it may be matter of encouragement in this respect, though one also of regret, to observe how much oftener man destroys natural sublimity, than nature crushes human power. It does not need much to humiliate a mountain. A hut will sometimes do it; I never look up to the Col de Balme from Chamouni, without a violent feeling of provocation against its hospitable little cabin, whose bright white walls form a visibly four-square spot on the green ridge, and entirely destroy all idea of its elevation. A single villa will often mar a whole landscape,6 and dethrone a dynasty of hills; and the Acropolis of Athens, Parthenon and all, has, I believe, been dwarfed into a model by the palace lately built beneath it.7 The fact is, that hills are not so high as we fancy them,8 and, when to the actual impression of no mean comparative size, is added the sense of the toil of manly hand and thought, a sublimity is reached, which nothing but gross error in arrangement of its parts can destroy. § 5. While, therefore, it is not to be supposed that mere size will ennoble a mean design, yet every increase of magnitude will bestow upon it a certain degree of nobleness:9 so that it is well to determine at first, whether the building is to be markedly beautiful, or markedly sublime; and if the [104/105] latter, not to be withheld by respect to smaller parts from reaching largeness of scale; provided only, that it be evidently in the architect's power to reach at least that degree of magnitude which is the lowest at which sublimity begins, rudely definable as that which will make a living figure look less than life beside it. It is the misfortune of most of our modern buildings that we would fain have an universal excellence in them; and so part of the funds must go in painting, part in gilding, part in fitting up, part in painted windows, part in small steeples, part in ornaments here and there; and neither the windows, nor the steeple, nor the ornaments, are worth their materials. For there is a crust about the impressible part of men's minds, which must be pierced through before they can be touched to the quick; and though we may prick at it and scratch it in a thousand separate places, we might as well have let it alone if we do not come through somewhere with a deep thrust: and if we can give such a thrust anywhere, there is no need of another; it need not be even so "wide as a church door," so that it be enough.10 And mere weight will do this; it is a clumsy way of doing it, but an effectual one, too; and the apathy which cannot be pierced through by a small steeple, nor shone through by a small window, can be broken through in a moment by the mere weight of a great wall. Let, therefore, the architect who has not large resources, choose his point of attack first, and, if he chooses size, let him abandon decoration; for, unless they are concentrated, and numerous enough to make their concentration conspicuous, all his ornaments together will not be worth one huge stone. And the choice must be a decided one, without compromise. It must be no question whether his capitals would not look better with a little carving let him leave them huge as blocks; or whether his arches should not have richer architraves let him throw them a foot higher, if he can; a yard more across the nave will be worth more to him than a tesselated pavement; and another fathom of outer [105/106] wall, than an army of pinnacles.11 The limitation of size must be only in the uses of the building, or in the ground at his disposal. It has often been observed that a building, in order to show its magnitude, must be seen all at once; it would, perhaps, be better to say, must be bounded as much as possible by continuous lines, and that its extreme points should be seen all at once; or we may state, in simpler terms still, that it must have one visible bounding line from top to bottom, and from end to end. 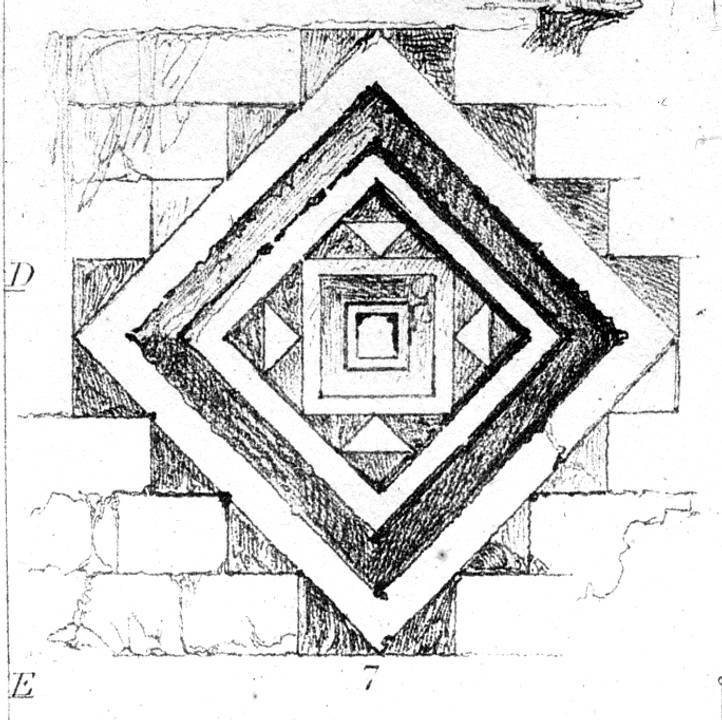 This bounding line from top to bottom may either be inclined inwards, and the mass therefore, pyramidical; or vertical, and the mass form one grand cliff; or inclined outwards, as in the advancing fronts of old houses, and, in a sort, in the Greek temple, and in all buildings with heavy cornices or heads. 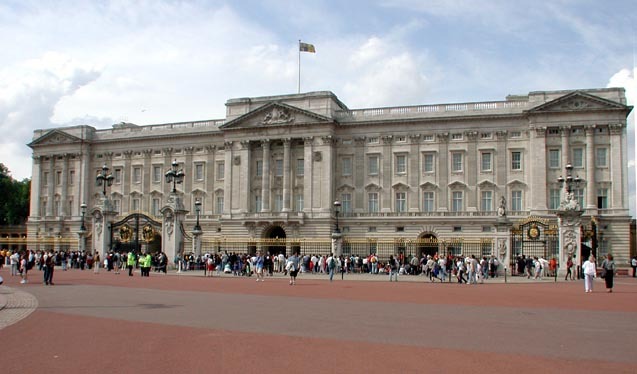 Now, in all these cases, if the bounding line be violently broken; if the cornice project, or the upper portion of the pyramid recede, too violently, [106/107] majesty will be lost; not because the building cannot be seen all at once, for in the case of a heavy cornice no part of it is necessarily concealed but because the continuity of its terminal line is broken, and the length of that line, therefore, cannot be estimated. But the error is, of course, more fatal when much of the building is also concealed; as in the wellknown case of the recession of the dome of St. Peter's, and from the greater number of points of view, in churches whose highest portions, whether dome or tower, are over their cross. Thus there is only one point from which the size of the Cathedral of Florence is felt; and that is from the corner of the Via de' Balestrieri, opposite the south-east angle, where it happens that the dome is seen rising instantly above the apse and transepts. In all cases in which the tower is over the cross, the grandeur and height of the tower itself are lost, because there is but one line down which the eye can trace the whole height, and that is in the inner angle of the cross, not easily discerned. Hence, while, in symmetry and feeling, such designs may often have pre-eminence, yet, where the height of the tower itself is to be made apparent, it must be at the west end, or, better still, detached as a campanile. 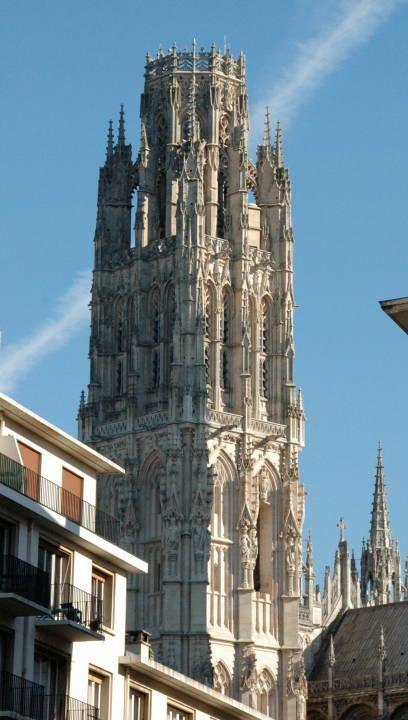 Imagine the loss to the Lombard churches if their campaniles were carried only to their present height over their crosses; or to the Cathedral of Rouen, if the Tour de Beurre were made central, in the place of its present debased spire! Three views of the Tour de Beurre, Rouen Cathedral. § 7. Whether, therefore, we have to do with tower or wall, there must be one bounding line from base to coping; and I am much inclined, myself, to love the true vertical, or the vertical, with a solemn frown of projection, (not a scowl,) as in the Palazzo Vecchio of Florence. This character is always given to rocks by the poets; with slight foundation indeed, real rocks being little given to overhanging13 but with excellent judgment; for the sense of threatening conveyed by this form is a nobler character than that of mere size. And, in buildings, this threatening should be somewhat carried down [107/108] into their mass. A mere projecting shelf is not enough; the whole wall must, Jupiter like, nod as well as frown. Hence, I think the propped machicolations of the Palazzo Vecchio and Duomo of Florence far grander headings than any form of Greek cornice. Sometimes the projection may be thrown lower, as in the Doge's palace of Venice,14 where the chief appearance of it is above the second arcade; or it may become a grand swell from the ground, as the head of a ship of the line rises from the sea. 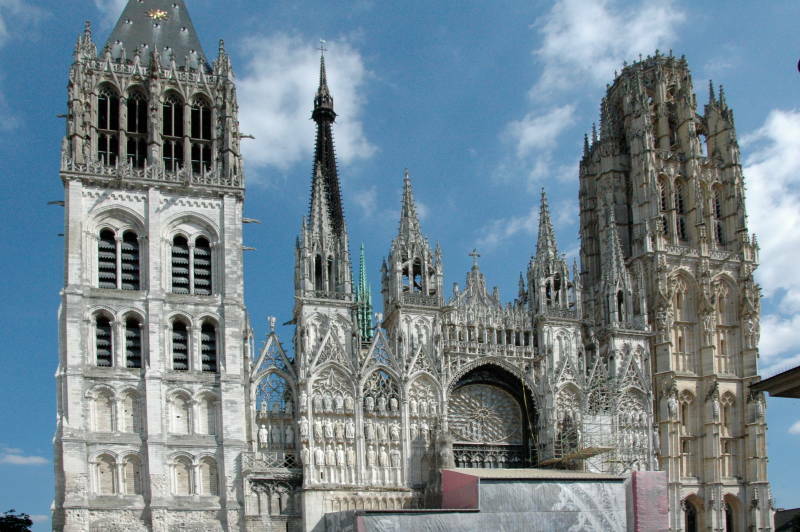 This is very nobly attained by the projection of the niches in the third storey of the Tour de Beurre at Rouen. § 8. What is needful in the setting forth of magnitude in height, is right also in the marking it in area let it be gathered well together. It is especially to be noted with respect to the Palazzo Vecchio and other mighty buildings of its order, how mistakenly it has been stated that dimension, in order to become impressive, should be expanded either in height or length, but not equally: whereas, rather it will be found that those buildings seem on the whole the vastest which have been gathered up into a mighty square, and which look as if they had been measured by the angel's rod, "the length, and the breadth, and the height of it are equal;" 15 and herein something is to be taken notice of, which I believe not to be sufficiently, if at all, considered among our architects. § 9. This, then, being, as I think, one of the peculiar elements of sublime architecture, it may be easily seen how necessarily consequent upon the love of it17* will be the choice of a form approaching to the square for the main outline. For, in whatever direction the building is contracted, in that direction the eye will be drawn to its terminal lines; and the sense of surface will only be at its fullest when those lines are removed, in every direction, as far as possible. Thus the square and circle are pre-eminently the areas of power among those bounded by purely straight or curved lines; and these, with their relative solids, the cube and sphere, and relative solids of progression, (as in the investigation of the laws of proportion I shall call those masses which are generated by the progression of an area of given form along a line in a given direction,)18 the square and cylindrical column, are the elements of utmost power in all architectural arrangements. On the other hand, grace and perfect proportion require an elongation in some one direction: and a sense of power may be communicated to this form of magnitude by a continuous series of any marked features, such as the eye may be unable to number; while yet we feel, from their boldness, decision, and simplicity, that it is indeed their multitude which has embarrassed us, not any confusion or indistinctness of form. This expedient of continued series forms the sublimity of arcades and aisles, of all ranges of columns, and, on a smaller scale, of those Greek mouldings, of which, repeated as they now are in all the meanest and most familiar forms of our furniture, it is impossible altogether to weary. Now, it is evident that the architect has choice of two types of form, each properly associated with its own kind of interest or decoration: the square, or greatest area, to be chosen especially when the surface is to be the subject of thought; and the elongated area, when the [110/111] divisions of the surface are to be subjects of thought. 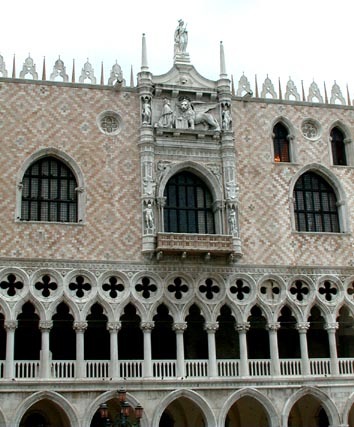 Both these orders of form, as I think nearly every other source of power and beauty, are marvellously united in that building which I fear to weary the reader by bringing forward too frequently, as a model of all perfection the Doge's palace at Venice: its general arrangement, a hollow square; its principal facade, an oblong, elongated to the eye by a range of thirty-four small arches, and thirty-five columns, while it is separated by a richly canopied window in the centre, into two massive divisions, whose height and length are nearly as four to five; the arcades which give it length being confined to the lower storeys, and the upper, between its broad windows, left a mighty surface of smooth marble, chequered with blocks of alternate rose-colour and white. It would be impossible, I believe, to invent a more magnificent arrangement of all that is in building most dignified and most fair. semidome for its roof, and three ranges of circular arches for its exterior ornament; in the interior of the nave, a range of circular arches below a circular-arched triforium, and a vast flat surface, observe, of wall decorated with striped marble above; the whole arrangement (not a peculiar one, but [111/112] characteristic of every church of the period; and, to my feeling, the most majestic; not perhaps the fairest, but the mightiest type of form which the mind of man has ever conceived19*) based exclusively on associations of the circle and the square. I am now, however, trenching upon ground which I desire to reserve for more careful examination, in connection with other esthetic questions: but I believe the examples I have given will justify my vindication of the square form from the reprobation which has been lightly thrown upon it; nor might this be done for it only as a ruling outline, but as occurring constantly in the best mosaics, and in a thousand forms of minor decoration, which I cannot now examine; my chief assertion of its majesty being always as it is an exponent of space and surface, and therefore to be chosen, either to rule in their outlines, or to adorn by masses of light and shade those portions of buildings in which surface is to be rendered precious or honourable. § 11. Thus far, then, of general forms, and of the modes in which the scale of architecture is best to be exhibited. Let us next consider the manifestations of power which belong to its details and lesser divisions. § 12. Next to those of the masonry, we have to consider the divisions of the design itself. Those divisions are, necessarily, either into masses of light and shade, or else by traced lines; which latter must be, indeed, themselves produced by incisions or projections which, in some lights, cast a certain breadth of shade, but which may, nevertheless, if finely enough cut, be always true lines, in distant effect. I call, for instance, such panelling as that of Henry the Seventh's chapel,25 pure linear division. Now, it does not seem to me sufficiently recollected, that a wall surface is to an architect simply what a white canvas is to a painter, with this only difference, that the wall has already a sublimity in its height, substance, and other characters already considered, on which it is more dangerous to break than to touch with shade the canvas surface. And, for my own part, I think a smooth, broad, freshly laid surface of gesso a fairer thing than most pictures I see painted on it; much more, a noble surface of stone than most architectural features which it is caused to assume. But however this may be, the canvas and wall are supposed to be given, and it is our craft to divide them. And the principles on which this division is to be made, are, as regards relation of quantities, the same in architecture as in painting, or indeed in any other art whatsoever, only the painter is by his varied subject partly permitted, partly compelled, to dispense with the symmetry of architectural light and shade, and to adopt arrangements apparently free and accidental. So that in modes of grouping there is much difference (though no opposition) between the two arts; but in rules of quantity, both are alike, so far forth as their commands of means are [115/116] alike. For the architect not being able to secure always the same depth or decision of shadow, nor to add to its sadness by colour, (because even when colour is employed, it cannot follow the moving shade,) is compelled to make many allowances, and avail himself of many contrivances, which the painter needs neither consider nor employ. §18. Of these limitations the first consequence is, that positive shade is a more necessary and more sublime thing in an architect's hands than in a painter's. For the latter being able to temper his light with an undertone throughout, and to make it delightful with sweet colour, or awful with lurid colour, and to represent distance, and air, and sun, by the depth of it, and fill its whole space with expression, can deal with an enormous, nay, almost with an universal, extent of it, and the best painters most delight in such extent; but as light, with the architect, is nearly always liable to become full and untempered sunshine seen upon solid surface, his only rests, and his chief means of sublimity, are definite shades. So that, after size and weight, the Power of architecture may be said to depend on the quantity (whether measured in space or intenseness) of its shadow;26 and it seems to me, that the reality of its works, and the use and influence they have in the daily life of men, (as opposed to those works of art with which we have nothing to do but in times of rest or of pleasure,) require of it that it should express a kind of human sympathy, by a measure of darkness as great as there is in human life: and that as the great poem and great fiction generally affect us most by the majesty of their masses of shade, and cannot take hold upon us if they affect a continuance of lyric sprightliness, but must be often serious, and sometimes melancholy, else they do not express the truth of this wild world of ours;27 so there must be, in this magnificently human art of architecture, some equivalent expression for the trouble and wrath of life, for its sorrow and its [116/117] mysteiy: and this it can only give by depth or diffusion of gloom, by the frown upon its front, and the shadow of its recess. So that Rembrandtism is a noble manner in architecture, though a false one in painting; and I do not believe that ever any building was truly great, unless it had mighty masses, vigorous and deep, of shadow mingled with its surface. And among the first habits that a young architect should learn, is that of thinking in shadow, not looking at a design in its miserable liny skeleton; but conceiving it as it will be when the dawn lights it, and the dusk leaves it;28 when its stones will be hot, and its crannies cool; when the lizards will bask on the one, and the birds build in the other. Let him design* with the sense of cold and heat upon him; let him cut out the shadows, as men dig wells in unwatered plains; and lead along the lights, as a founder does his hot metal; let him keep the full command of both, and see that he knows how they fall, and where they fade. His paper lines and proportions are of no value: all that he has to do must be done by spaces of light and darkness; and his business is to see that the one is broad and bold enough not to be swallowed up by twilight, and the other deep enough not to be dried like a shallow pool by a noon-day sun. And, that this may be, the first necessity is that the quantities of shade or light, whatever they may be, shall be thrown into masses, either of something like equal weight, or else large masses of the one relieved with small of the other; but masses of one or other kind there must be. No design that is divided at all, and yet not divided into masses, can [117/118] ever be of the smallest value: this great law respecting breadth, precisely the same in architecture and painting, is so important, that the examination of its two principal applications will include most of the conditions of majestic design on which I would at present insist. § 14. Painters are in the habit of speaking loosely of masses of light and shade, meaning thereby any large spaces of either. Nevertheless, it is convenient sometimes to restrict the term " mass " to the portions to which proper form belongs, and to call the field on which such forms are traced, interval. Thus, in foliage with projecting boughs or stems, we have masses of light, with intervals of shade; and, in light skies with dark clouds upon them, masses of shade, with intervals of light. 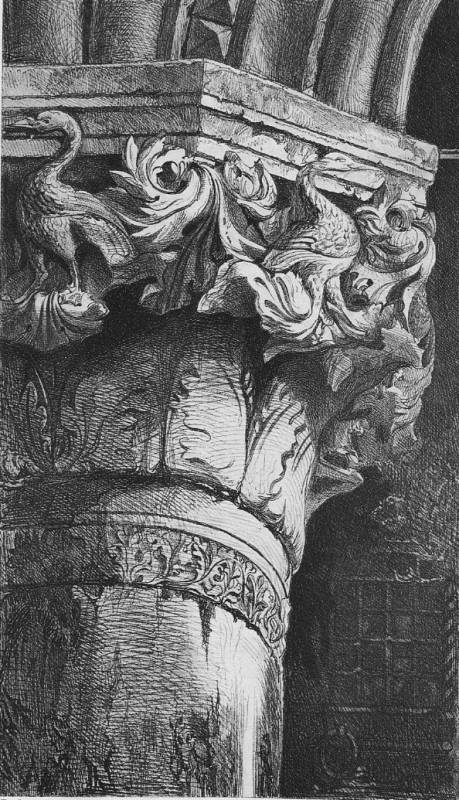 This distinction is, in architecture, still more necessary; for there are two marked styles dependent upon it: one in which the forms are drawn with light, upon darkness, as in Greek sculpture and pillars; the other in which they are drawn with darkness upon light, as in early Gothic foliation. Now, it is not in the designer's power determinately to vary degrees and places of darkness, but it is altogether in his power to vary in determined directions his degrees of light. Hence the use of the dark mass characterises, generally, a trenchant style of design, in which the darks and lights are both flat, and terminated by sharp edges; while the use of the light mass is in the same way associated with a softened and full manner of design, in which the darks are much warmed by reflected lights, and the lights are rounded and melt into them. The term applied by Milton to Doric bas-relief " bossy," is, as is generally the case with Milton's epithets, the most comprehensive and expressive of this manner, which the English language contains; while the term which specifically describes [118/119] he chief member of early Gothic decoration, feuille, foil or leaf, is equally significative of a flat space of shade. § 15. We shall shortly consider the actual modes in which these two kinds of mass have been treated. And, first, of the light, or rounded, mass. The modes in which relief was secured for the more projecting forms of bas-relief, by the Greeks, have been too well described by Sir Charles Eastlake 31* to need recapitulation; the conclusion which forces itself upon us from the facts he has remarked, being one on which I shall have occasion farther to insist presently, that the Greek workman cared for shadow only as a dark field wherefrom his light figure or design might be intelligibly detached: his attention was concentrated on the one aim at readableness and clearness of accent; and all composition, all harmony, nay, the very vitality and energy of separate groups were, when necessary, sacrificed to plain speaking. Nor was there any predilection for one kind of form rather than another. Rounded forms were, in the columns and principal decorative members, adopted, not for their own sake, but as characteristic of the things represented. They were beautifully rounded, because the Greek habitually did well what he had to do, not because he loved roundness more than squareness; severely rectilinear forms were associated with the curved ones in the cornice and triglyph, and the mass of the pillar was divided by a fluting, which, in distant effect, destroyed much of its breadth.sup>32 What power of light these primal arrangements left, was diminished in successive refinements and additions of ornament; and continued to diminish through Roman work, until the confirmation of the circular arch as a decorative feature. Its lovely and simple line taught the eye to ask for a similar boundary of solid form; the dome followed, and necessarily the decorative masses were thenceforward managed with reference to, and in sympathy with, the chief feature of the building. Hence arose, among the Byzantine architects, a [119/120] system of ornament, entirely restrained within the superficies of curvilinear masses, on which the light fell with as unbroken gradation as on a dome or column, while the illumined surface was nevertheless cut into details of singular and most ingenious intricacy. 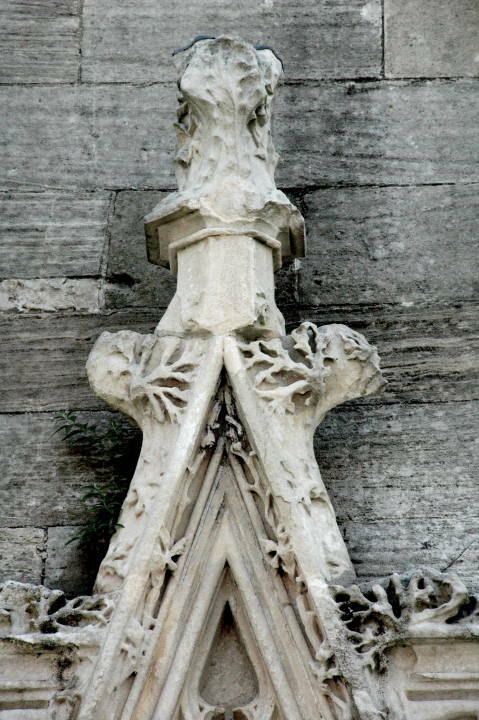 Something is, of course, to be allowed for the less dexterity of the workmen; it being easier to cut down into a solid block, than to arrange the projecting portions of leaf on the Greek capital: such leafy capitals are nevertheless executed by the Byzantines with skill enough to show that their preference of the massive form was by no means compulsory, nor can I think it unwise. On the contrary, while the arrangements of line are far more artful33 in the Greek capital, the Byzantine light and shade are as incontestably more grand and masculine, based on that quality of pure gradation, which nearly all natural objects possess, and the attainment of which is, in fact, the first and most palpable purpose in natural arrangements of grand form. Three plates to which Ruskin refers in § 16 — left to right: Plate I. fig. 3, Plate VI, and Plate V.
§ 16. I have endeavoured to give some idea of one of the hollow balls of stone which, surrounded by flowing leafage, occur in varied succession on the architrave of the central gate of St. Mark's at Venice, in Plate I. fig. 3. It seems to me singularly beautiful in its unity of lightness, and delicacy of detail, with breadth of light. It looks as if its leaves had been sensitive, and had risen and shut themselves into a bud at some sudden touch, and would presently fall back again into their wild flow. 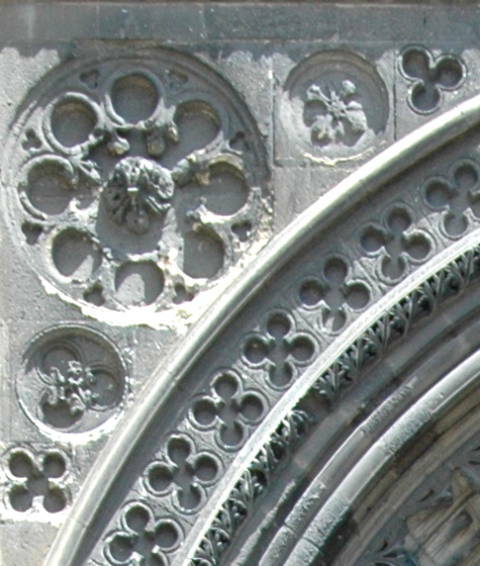 The cornices of San Michele of Lucca,35 seen above and below the arch, in Plate VI., show the effect of heavy leafage and thick stems arranged on a surface whose curve is a simple quadrant, the light dying from off them as it turns. 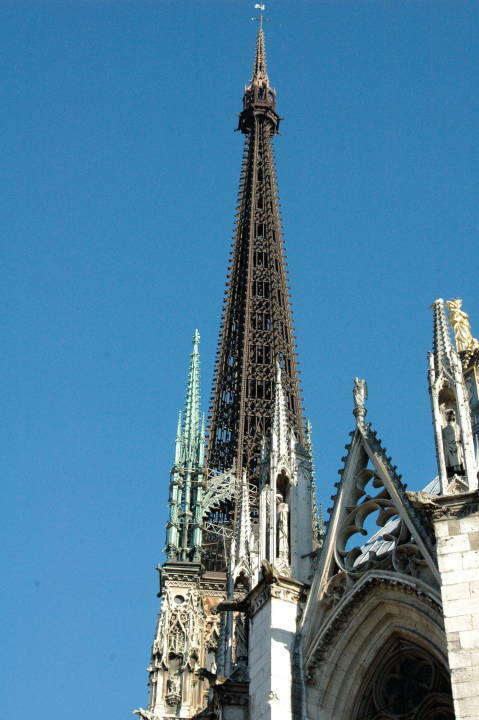 It would be difficult, as I think, to invent any thing more noble: and I insist on the broad character of their arrangement the more earnestly, because, afterwards modified by greater skill in its management, it became characteristic of the richest pieces of Gothic design. The capital,36 given in [121/122] Plate V., is of the noblest period of the Venetian Gothic; and it is interesting to see the play of leafage so luxuriant,37 absolutely subordinated to the breadth of two masses of light and shade. What is done by the Venetian architect, with a power as irresistible as that of the waves of his surrounding sea, is done by the masters of the Cis-Alpine Gothic, more timidly, and with a manner somewhat cramped and cold, but not less expressing their assent to the same great law. The ice spiculsæ38 of the North, and its broken sunshine, seem to have image in, and influence on, the work; and the leaves which, under the Italian's hand, roll, and flow, and bow down over their black shadows, as in the weariness of noon-day heat, are, in the North, crisped and frost-bitten, wrinkled on the edges, and sparkling as if with dew. But the rounding of the ruling form is not less sought and felt. In the lower part of Plate I. (3) the ornament in its surroundings; and (4) a similar ornament. is the finial of the pediment given in Plate II., from the cathedral of St. Lô [photographs]. 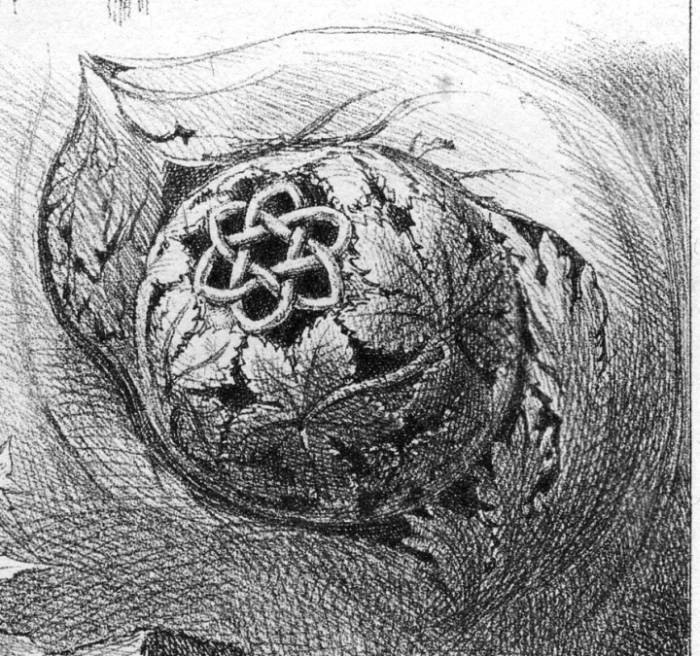 It is exactly similar in feeling to the Byzantine capital, being rounded under the abacus by four branches39 of thistle-leaves, whose stems, springing from the angles, bend outwards and fall back to the head, throwing their jaggy spines down upon the full light, forming two sharp quatrefoils. I could not get near enough to this finial to see with what degree of delicacy the spines were cut; but I have sketched a natural group of thistle-leaves beside it, that the reader may compare the types, and see with what mastery they are subjected to the broad form of the whole.40 The small capital from Coutances, Plate XIII., fig. 4, which is of earlier date, is of simpler elements, and exhibits the principle still more clearly; but the St. Lô finial is only one of a thousand [122/123] instances which might be gathered even from the fully developed flamboyant, the feeling of breadth being retained in minor ornaments, long after it had been lost in the main design, and sometimes capriciously renewing itself throughout, as in the cylindrical niches and pedestals which enrich the porches of Caudebec41 and Rouen. Fig. 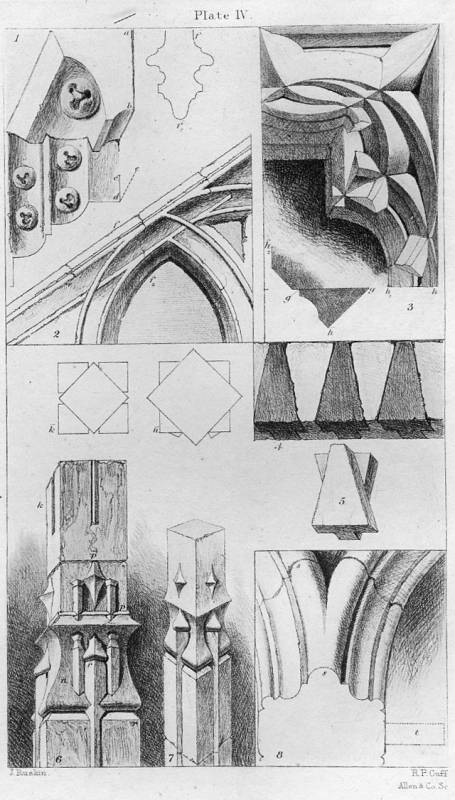 1, Plate I., is the simplest of those of Rouen; in the more elaborate there are four projecting sides, divided by buttresses into eight rounded compartments of tracery; even the whole bulk of the outer pier is treated with the same feeling; and though composed partly of concave recesses, partly of square shafts, partly of statues and tabernacle work, arranges itself as a whole into one richly rounded tower. § 17. I cannot here enter into the curious questions connected with the management of larger curved surfaces; into the causes of the difference in proportion necessary to be observed between round and square towers; nor into the reasons42 why a column or ball may be richly ornamented, while surface decoration would be inexpedient on masses like the Castle of St. Angelo, the tomb of Cecilia Metella, or the dome of St. Peter's. But what has been above said of the desirableness of serenity in plane surfaces, applies still more forcibly to those which are curved; and it is to be remembered that we are, at present, considering how this serenity and power may be carried into minor divisions, not how the ornamental character of the lower form may, upon occasion, be permitted to fret the calmness of the higher. Nor, though the instances we have examined are of globular or cylindrical masses chiefly, is it to be thought that breadth can only be secured by such alone: many of the noblest forms are of subdued curvature, sometimes hardly visible; but curvature of some degree there must be, in order to secure any measure of grandeur in a small mass of light. One of the most marked [123/124] distinctions between one artist and another, in the point of skill, will be found in their relative delicacy of perception of rounded surface; the full power of expressing the perspective, foreshortening, and various undulation of such surface is, perhaps, the last and most difficult attainment of the hand and eye. For instance: there is, perhaps, no tree which has baffled the landscape painter more than the common black spruce fir.43 It is rare that we see any representation of it other than caricature. It is conceived as if it grew in one plane, or as a section of a tree, with a set of boughs symmetrically dependent on opposite sides. It is thought formal, unmanageable, and ugly. It would be so, if it grew as it is drawn. But the Power of the tree is not in that chandelierlike section. It is in the dark, flat, solid tables of leafage, which it holds out on its strong arms, curved slightly over them like shields, and spreading towards the extremity like a hand. It is vain to endeavour to paint the sharp, grassy, intricate leafage, until this ruling form has been secured; and in the boughs that approach the spectator, the foreshortening of it is like that of a wide hill country, ridge just rising over ridge in successive distances; and the finger-like extremities, foreshortened to absolute bluntness, require a delicacy in the rendering of them like that of the drawing of the hand of the Magdalene upon the vase in Mr. Rogers's Titian.44 Get but the back of that foliage, and you have the tree; but I cannot name the artist who has thoroughly felt it. So, in all drawing and sculpture, it is the power of rounding, softly and perfectly, every inferior mass which preserves the serenity, as it follows the truth, of Nature, and which demands the highest knowledge and skill from the workman. 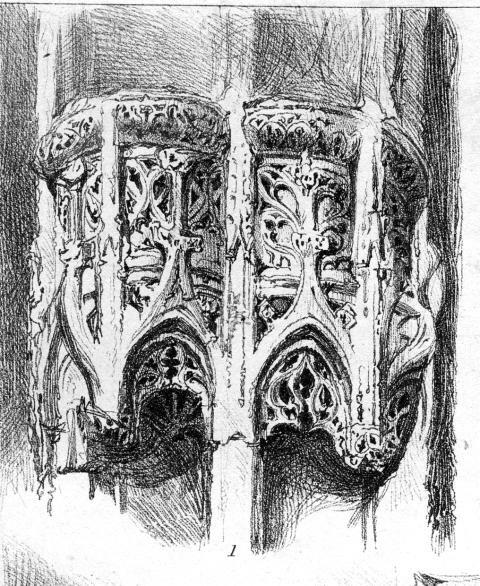 A noble design may always be told by the back of a single leaf, and it was the sacrifice of this breadth and refinement of surface for sharp edges and extravagant undercutting, which destroyed the Gothic mouldings, as the substitution of the line for the light [124/125] destroyed the Gothic tracery. This change, however, we shall better comprehend after we have glanced at the chief conditions of arrangement of the second kind of mass; that which is flat, and of shadow only. 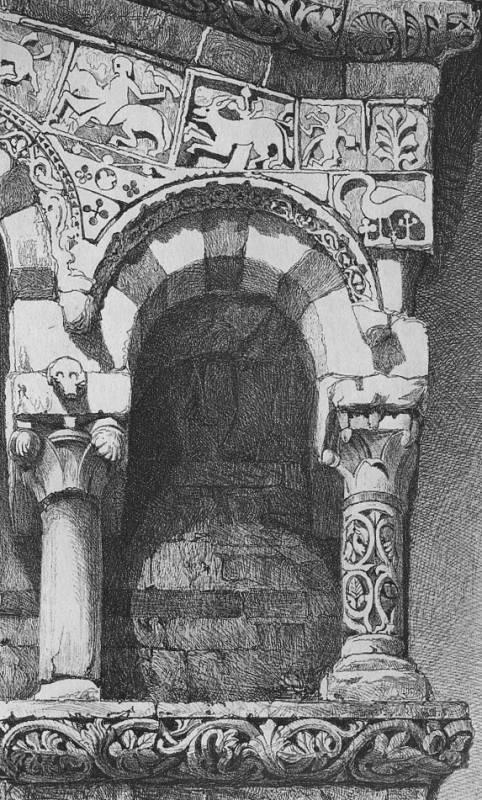 Left: Plate 6, Arch from the Façade of the Church of San Michele, Lucca. Left: Balcony of the Grand Council Chamber, Palazzo Ducale: window, bas-relief, and balcony. § 19. In order to the obtaining their full effect, it is evident [126/127] that much caution is necessary in the management of the glass. In the finest instances, the traceries are open lights, either in towers, as in this design of Giotto's, or in external arcades like that of the Campo Santo at Pisa or the Doge's Palace at Venice; and it is thus only that their full beauty is shown. In domestic buildings, or in windows of churches necessarily glazed, the glass was usually withdrawn entirely behind the traceries. Those of the Cathedral of Florence stand quite clear of it, casting their shadows in well-detached lines, so as in most lights to give the appearance of a double tracery. In those few instances in which the glass was set in the tracery itself, as in Or San Michele, the effect of the latter is half destroyed: perhaps the especial attention paid by Orcagna to his surface ornament, was connected with the intention of so glazing them. 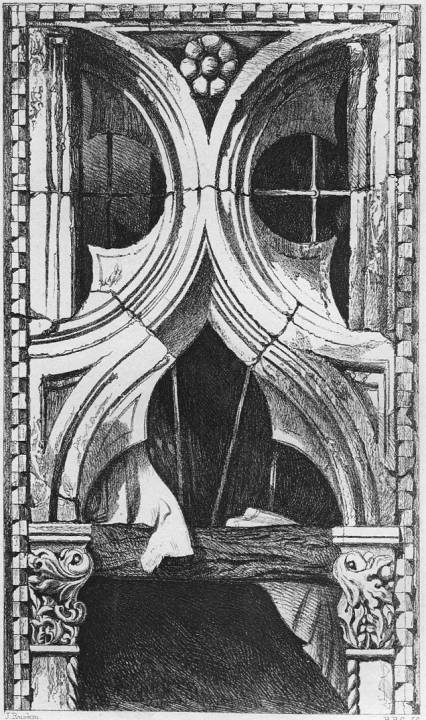 It is singular to see, in late architecture, the glass, which tormented the bolder architects, considered as a valuable means of making the lines of tracery more slender; as in the smallest intervals of the windows of Merton College, Oxford,48 where the glass is advanced about two inches from the centre of the tracery bar, (that in the larger spaces being in the middle, as usual,) in order to prevent the depth of shadow from farther diminishing the apparent interval.49* Much of the lightness of the effect of the traceries is owing to this seemingly unimportant arrangement. But, generally speaking, glass spoils all traceries; and it is much to be wished that it should be kept well within them, when it cannot be dispensed with, and that the most careful and [127/128] beautiful designs should be reserved for situations where no glass would be needed. § 20. The method of decoration by shadow was, as far as we have hitherto traced it, common to the northern and southern Gothic. But in the carrying out of the system they instantly diverged. Having marble at his command, and classical decoration in his sight, the southern architect was able to carve the intermediate spaces with exquisite leafage, or to vary his wail surface with inlaid stones. The northern architect neither knew the ancient work, nor possessed the delicate material; and he had no resource but to cover his walls with holes, cut into foiled shapes like those of the windows. This he did, often with great clumsiness, but always with a vigorous sense of composition, and always, observe, depending on the shadows for effect. Where the wall was thick, and could not be cut through, and the foilings were large, those shadows did not fill the entire space; but the form was, nevertheless, drawn on the eye by means of them, and when it was possible, they were cut clear through, as in raised screens of pediment, like those of the west front of Bayeux: cut so deep in every case, as to secure, in all but a direct low front light, great breadth of shadow. 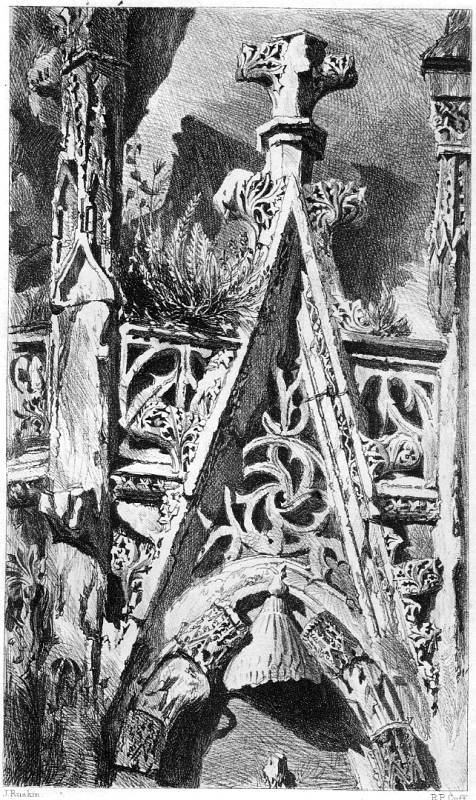 Left: Plate 7, Shafts and Spandrel from the South-West Door of the Cathedral of Lisieux . 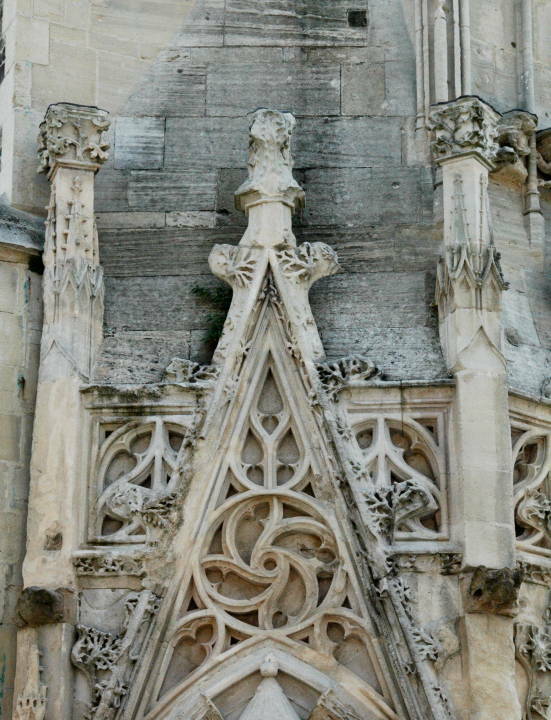 The spandrel, given at the top of Plate VII., is from the south-western entrance of the cathedral of Lisieux; one of the most quaint and interesting doors in Normandy, probably soon to be lost for ever, by the continuance of the masonic operations which have already destroyed the northern tower. 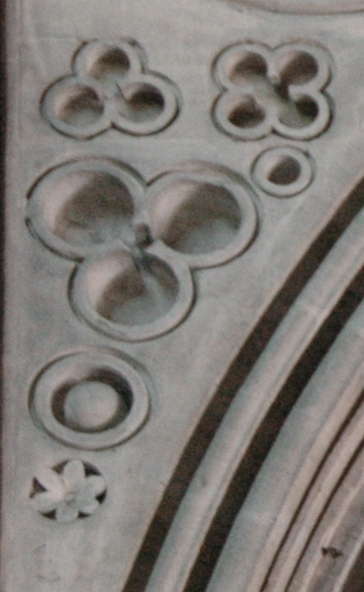 Its work is altogether rude, but full of spirit; the opposite spandrels have different, though balanced, ornaments very inaccurately adjusted, each rosette or star (as the five-rayed figure, now quite defaced, in the upper portion appears to [128/129] have been) cut on its own block of stone and fitted in with small nicety, especially illustrating the point I have above insisted upon the architect's utter neglect of the forms of intermediate stone, at this early period. The arcade, of which a single arch and shaft are given on the left, forms the flank of the door; three outer shafts bearing three orders within the spandrel which I have drawn, and each of these shafts carried over an inner arcade, decorated above with quatrefoils, cut concave and filled with leaves, the whole disposition exquisitely picturesque and full of strange play of light and shade. For some time the penetrative ornaments, if so they may be for convenience called, maintained their bold and independent character. Then they multiplied and enlarged, becoming shallower as they did so; then they began to run together, one swallowing up, or hanging on to, another, like bubbles in expiring foam fig. 4, from a spandrel at Bayeux,52 looks as if it had been blown from a pipe; finally, they lost their individual character altogether, and the eye was made to rest on the separating lines of tracery, as we saw before in the window; and then came the great change and the fall of the Gothic power. Left: Plate 8, Window from the Ca' Foscari, Venice. Right: Plate 4, Intersectional Mouldings. And his power to do this depended altogether on his retaining the forms of the shadows in his sight. Far from carrying the eye to the ornaments, upon the stone, he abandoned these latter one by one; and while his mouldings received the most shapely order and symmetry, closely correspondent with that of the Rouen tracery, (compare Plates [131/132] IV. and VIII.,) he kept the cusps within them perfectly flat, decorated, if at all, with a trefoil (Palazzo Foscari), or fillet (Doge's Palace), just traceable and no more, so that the quatrefoil, cut as sharply through them as if it had been struck out by a stamp, told upon the eye, with all its four black leaves, miles away. No knots of flowerwork, no ornaments of any kind, were suffered to interfere with the purity of its form: the cusp is usually quite sharp; but slightly truncated in the Palazzo Foscari, and charged with a simple ball in that of the Doge; and the glass of the window, where there was any, was, as we have seen, thrown back behind the stonework, that no flashes of light might interfere with its depth. Corrupted forms, like those of the Casa d'Oro and Palazzo Pisani,59 and several others, only serve to show the majesty of the common design. § 22. Such are the principal circumstances traceable in the treatment of the two kinds of masses of light and darkness, in the hands of the earlier architects; gradation in the one, flatness in the other, and breadth in both, being the qualities sought and exhibited by every possible expedient, up to the period when, as we have before stated, the line was substituted for the mass, as the means of division of surface. Enough has been said to illustrate this, as regards tracery; but a word or two is still necessary respecting the mouldings. Two recent (2010) photographs of the West Front of Bayeux Cahedral. Those of the earlier times were, in the plurality of instances, composed of alternate square and cylindrical shafts, variously associated and proportioned. Where concave cuttings occur, as in the beautiful west doors of Bayeux, they are between cylindrical shafts, which they throw out into broad light. The eye in all cases dwells on broad surfaces, and commonly upon few. In course of time, a low ridgy process is seen emerging along the outer edge of the cylindrical shaft, forming a line of light upon it and destroying its gradation. Hardly traceable at first, (as60 on the alternate rolls of the [132/133] north door of Rouen,) it grows and pushes out as gradually as a budding plant:61 sharp at first on the edge; but, becoming prominent, it receives a truncation, and becomes a definite fillet on the face of the roll. Not yet to be checked, it pushes forward until the roll itself becomes subordinate to it, and is finally lost in a slight swell upon its sides, while the concavities have all the time been deepening and enlarging behind it, until, from a succession of square or cylindrical masses, the whole moulding has become a series of concavities edged by delicate fillets, upon which, (sharp lines of light, observe,) the eye exclusively rests. While this has been taking place, a similar, though less total, change has affected the flowerwork itself. In Plate I., fig. 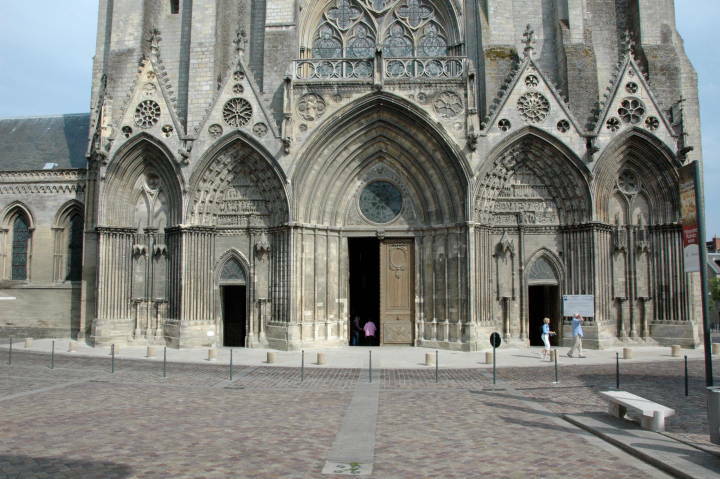 2 (a), I have given two from the transepts of Rouen. It will be observed how absolutely the eye rests on the forms of the leaves, and on the three berries in the angle, being in light exactly what the trefoil is in darkness. These mouldings nearly adhere to the stone; and are very slightly, though sharply, undercut. In process of time, the attention of the architect, instead of resting on the leaves, went to the stalks. These latter were elongated (b, from the south door of St. Lô) and to exhibit them better, the deep concavity was cut behind, so as to throw them out in lines of light. 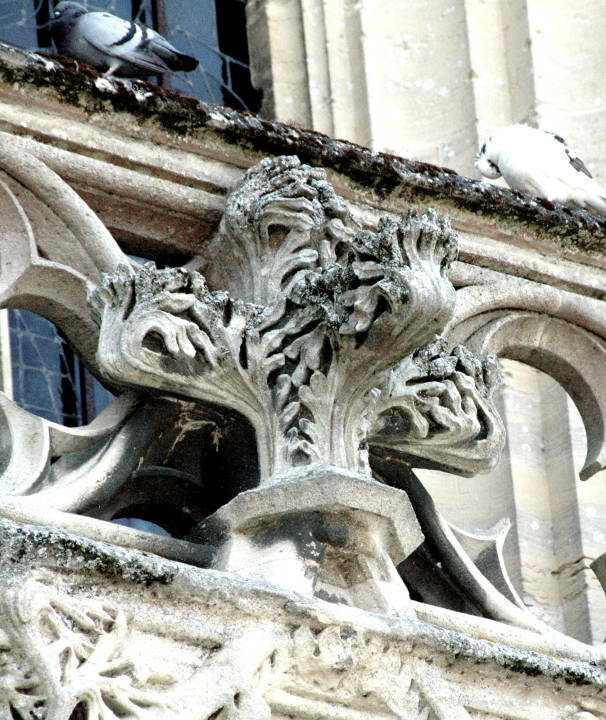 The system was carried out into continually increasing intricacy, until, in the transepts of Beauvais, we have brackets and flamboyant traceries, composed of twigs without any leaves at all. This, however, is a partial, though a sufficiently characteristic, caprice, the leaf being never generally banished, and in the mouldings round those same doors, beautifully managed, but itself rendered liny by bold marking of its ribs and veins, and by turning up, and crisping its edges, large intermediate spaces being always left to be occupied by intertwining stems, (c, from Caudebec). The trefoil of light formed by berries or acorns, though diminished in value, was never lost up to the last period of living Gothic. § 23. It is interesting to follow into its many ramifications, [133/134] the influence of the corrupting principle; but we have seen enough of it to enable us to draw our practical conclusion a conclusion a thousand times felt and reiterated in the experience and advice of every practised artist, but never often enough repeated, never profoundly enough felt. Of composition and invention much has been written, it seems to me vainly, for men cannot be taught to compose or to invent; of these, the highest elements of Power in architecture, I do not, therefore, speak; nor, here, of that peculiar restraint in the imitation of natural forms, which constitutes the dignity of even the most luxuriant work of the great periods. Of this restraint,62 I shall say a word or two in the next chapter;63 pressing now only the conclusion, as practically useful as it is certain, that the relative majesty of buildings depends more on the weight and vigour of their masses, than on any other attribute of their design: mass of everything, of bulk, of light, of darkness, of colour, not mere sum of any of these, but breadth of them; not broken light, nor scattered darkness, nor divided weight, but solid stone, broad sunshine, starless shade. Time would fail me altogether, if I attempted to follow out the range of the principle; there is not a feature, however apparently trifling, to which it cannot give power. The wooden fillings of belfry lights, necessary to protect their interiors from rain, are in England usually divided into a number of neatly executed cross-bars, like those of Venetian blinds, which, of course, become as conspicuous in their sharpness as they are uninteresting in their precise carpentry, multiplying, moreover, the horizontal lines which directly contradict those of the architecture. Abroad, such necessities are met by three or four downright penthouse roofs, reaching each from within the window to the outside shafts of its mouldings; instead of the horrible row of ruled lines, the space is thus divided into four or five grand masses of shadow, with grey slopes of roof above, bent or yielding into all kinds [134/135] of delicious swells and curves, and covered with warm tones of moss and lichen. Very often the thing is more delightful than the stone-work itself, and all because it is broad, dark, and simple. It matters not how clumsy, how common, the means are, that get weight and shadow sloping roof, jutting porch, projecting balcony, hollow niche, massy gargoyle, frowning parapet; get but gloom and simplicity, and all good things will follow in their place and time; do but design with the owl's eyes first, and you will gain the falcon's afterwards. § 24. am grieved to have to insist upon what seems so simple: it looks trite and commonplace when it is written, but pardon me this: for it is anything but an accepted or understood principle in practice, and the less excusably forgotten, because it is, of all the great and true laws of art, the easiest to obey. The executive facility of complying with its demands cannot be too earnestly, too frankly, asserted. There are not five men in the kingdom who could compose, nor twenty who could cut, the foliage with which the windows of Or San Michele are adorned; but there is many a village clergyman who could invent and dispose its black openings, and not a village mason who could not cut them.64 Lay a few clover or woodroof leaves on white paper, and a little alteration in their positions will suggest figures which, cut boldly through a slab of marble, would be worth more window traceries than an architect could draw in a summer's day.65 But I know not how it is, unless that our English hearts have more oak than stone in them, and have more filial sympathy with acorns than Alps; but all that we do is small and mean, [135/136] if not worse thin, and wasted, and unsubstantial. It is not modern work only; we have built like frogs and mice since the thirteenth century (except only in our castles). What a contrast between the pitiful little pigeon-holes which stand for doors in the east front of Salisbury, looking like the entrances to a beehive or a wasp's nest, and the soaring arches and kingly crowning of the gates of Abbeville, Rouen, and Rheims, or the rock-hewn piers of Chartres, or the dark and vaulted porches and writhed pillars of Verona! 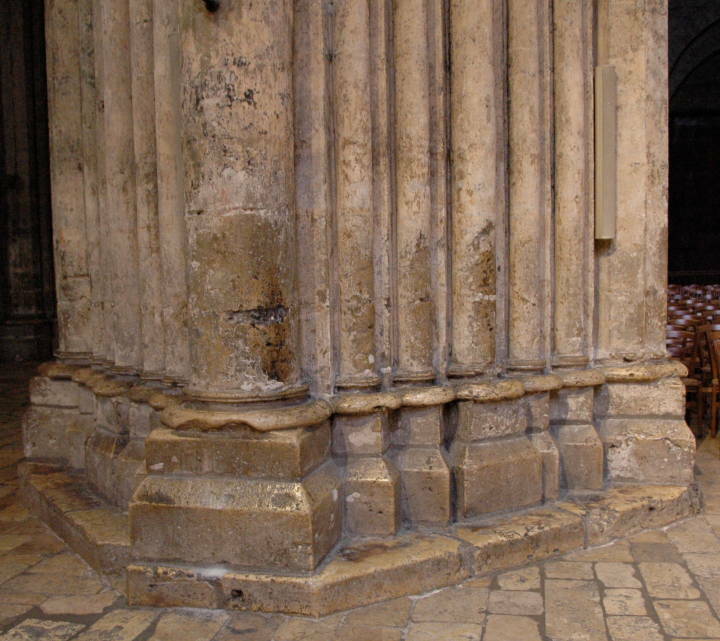 The rock-hewn piers of Chartres. This photograph shows an interior pier and not the external ones to which Ruskin refers, but it well illustrates his point. Of domestic architecture what need is there to speak? How small, how cramped, how poor, how miserable in its petty neatness is our best! how beneath the mark of attack, and the level of contempt, that which is common with us! What a strange sense of formalised deformity, of shrivelled precision, of starved accuracy, of minute misanthropy have we, as we leave even the rude streets of Picardy for the market towns of Kent! Until that street architecture of ours is bettered, until we give it some size and boldness, until we give our windows recess, and our walls thickness, I know not how we can blame our architects for their feebleness in more important work; their eyes are inured to narrowness and slightness: can we expect them at a word to conceive and deal with breadth and solidity? They ought not to live in our cities; there is that in their miserable walls which bricks up to death men's imaginations, as surely as ever perished forsworn nun. An architect should live as little in cities as a painter.66 Send him to our hills, and let him study there what nature understands by a buttress, and what by a dome. There was something in the old power of architecture, which it had from the recluse more than from the citizen. The buildings of which I have spoken with chief praise, rose, indeed, out of the war of the piazza, and above the fury of the populace: and Heaven forbid that for such cause we should ever have to lay a larger stone, or rivet a firmer bar, in our [136/137] England! But we have other sources of power, in the imagery of our iron coasts and azure hills; of power more pure, nor less serene, than that of the hermit spirit which once lighted with white lines of cloisters the glades of the Alpine pine, and raised into ordered spires the wild rocks of the Norman sea; which gave to the temple gate the depth and darkness of Elijah's Horeb cave;66 and lifted, out of the populous city, grey cliffs of lonely stone, into the midst of sailing birds and silent air.